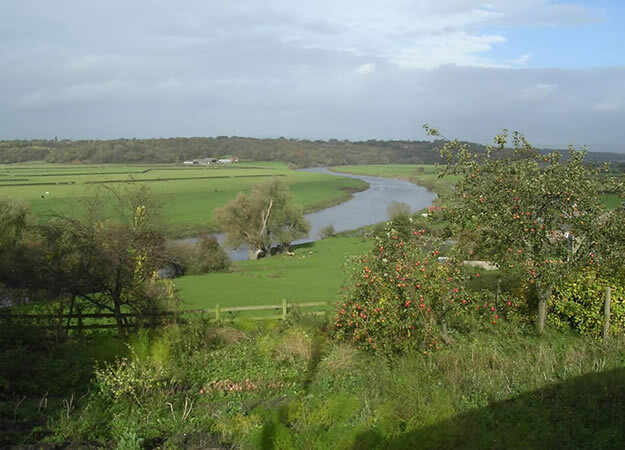 The River Ribble is a river that runs through North Yorkshire and Lancashire, in the North West of England. The River Ribble begins at the confluence of the Gayle Beck and Cam Beck near the famous island viaduct at Ribblehead, in the shadow of the Yorkshire three peaks (the mountains of Whernside, Ingleborough and Pen-y-ghent). It flows through Settle, Clitheroe and Preston (Walton le Dale), before emptying into the Irish Sea near Lytham, a length of 75 miles. The main tributaries of the River Ribble are the Hodder and Calder which join the river near Great Mitton, the River Darwen which joins at Walton le Dale and the River Douglas which joins near Hesketh Bank. The Ribble Way is a long-distance footpath which follows the river for much of its course. The Ribble marked the ancient northern boundary of Mercia; and at the time of the Domesday Book was the northern boundary of Cheshire. The River Ribble is connected to both the Leeds and Liverpool Canal and the Lancaster Canal (via the Ribble Link). The River Ribble catchment is covered by the Mersey Basin Campaign, a partnership which was established in 1985 to improve water quality and encourage waterside regeneration and the River Ribble’s estuary forms part of the Ribble and Alt Estuaries Special Protection Area for wildlife. Preston City Council have published controversial plans to build a barrage across the River Ribble, in their ‘Riverworks’ proposals. The aim of these proposals is to build a water sports park on a section of the Ribble, coupled with over 4000 units of high quality housing and businesses in the river’s flood plain. Some local residents are opposing these plans, arguing that they endanger wildlife, increase flood risk to local housing and damage greenbelt areas. These residents have set up the ‘Save The Ribble’ campaign. Parts of the river are a County Biological Heritage Site. Also, the River Ribble would appear to have been known in Roman times as the Belisama, possibly giving its name to Samlesbury. Ptolemy’s “Belisama aest.” seems to represent the estuary of the River Ribble.